At the age of 43, former US Gold medallist Al Oerter decided to make a comeback. He had quit in 1968 after the Mexico Olympics, but 12 years later he threw the discus about 18 m further than his gold medal distance of 64.6 m. What is his secret? Biomechanical analysis. 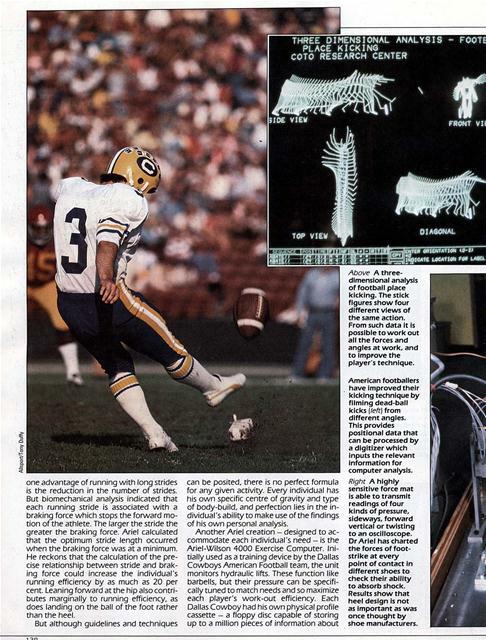 Oerter is one of many athletes whose techniques have been dramatically improved by this computer-aided science designed to optimize performance. The mastermind behind Oerter's newfound success is Dr Gideon Ariel, director of research at Computerized Biomechanical Analysis Inc., at Amherst, Massachusetts, a professor at the University of Massachusetts and Chairman and Co-founder of the Coto Research Centre. Ariel, himself a former Israeli Olympic discus-thrower, is a passionate exponent of biomechanics and already the hero of hundreds of athletes. Biomechanics is the study of the structure and function of the body which replaces the medical with the mechanical model. 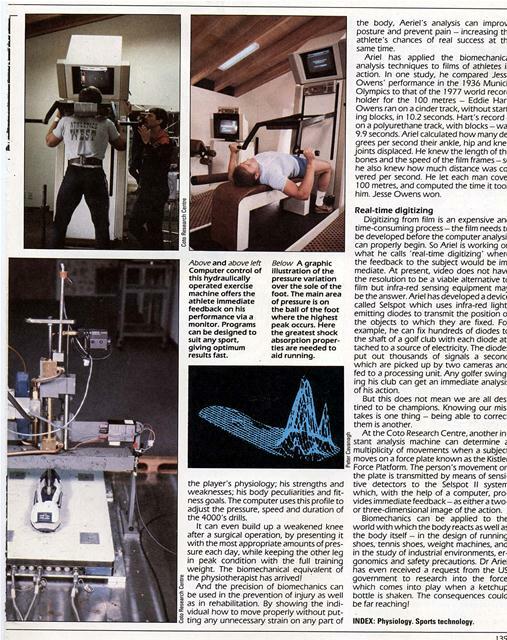 Working on the principle that the same laws of physics apply to any system in motion, regardless of whether it is a living organism ora machine, Dr Ariel has devised a method of assessing an athlete's performance using computer graphics. The necessary program took 10,000 hours to write - but enable an analysis time that can be accommodated within the training periods of all types of athlete. What happens is as follows: a camera shoots an athlete's motion from two or three different angles simultaneously, at speeds of up to 10,000 frames a second. Above left A polevaulter caught in action using highspeed film. This technique allows detailed frame by frame analysis of each of the athlete's movements which is the basis of the new science of biomechanics. Jimmy Connors serves another a (above). Inset The image's Joints ar plotted as x and coordinates and keyed Into the computer memo to produce 'stick figures'. Connor: service shot can r be analyzed. The high-speed images are then project on to a screen over an array of 20,000 u sensitive microphones. The analyst us sonic pen microphone to trace the athle position in each photo frame. (The film be frozen at any point.) A composite tra of the centres of the performer's join translated into x and y coordinates. 7 the coordinates of each joint and each F tion of the entire sequence are keyed the computer's memory. The joint cer are then linked together with trace line make a green stick-like image on the v display unit. 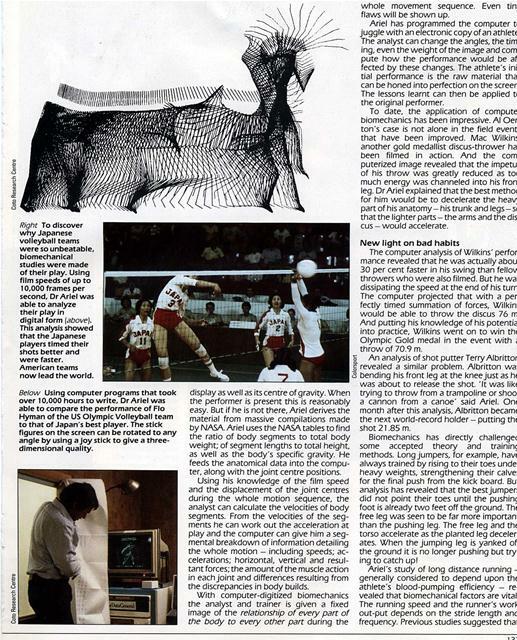 Right To discover why Japanese volleyball teams were so unbeatable, biomechanical studies were made of their play. Using film speeds of up to 10,000 frames per second, Dr Ariel was able to analyze their play in digital form (above). This analysis showed that the Japanese players timed their shots better and were faster. American teams now lead the world. whole movement sequence. Even tin, flaws will be shown up. Ariel has programmed the computer tc juggle with an electronic copy of an athlete The analyst can change the angles, the tim ing, even the weight of the image and com pute how the performance would be of fected by these changes. The athlete's ini tial performance is the raw material tha can be honed into perfection on the screen The lessons learnt can then be applied tc the original performer. 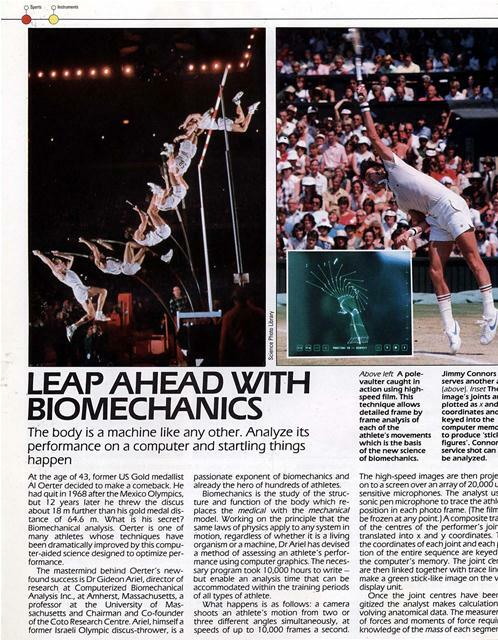 To date, the application of compute biomechanics has been impressive. Al Oer ton's case is not alone in the field event: that have been improved. Mac Wilkins another gold medallist discus-thrower ha., been filmed in action. And the com puterized image revealed that the impetus of his throw was greatly reduced as toc much energy was channeled into his fron leg. Dr Ariel explained that the best methoc for him would be to decelerate the heavy part of his anatomy - his trunk and legs - s( that the lighter parts - the arms and the dis cus - would accelerate. Below Using computer programs that took over 10,000 hours to write, Dr Ariel was able to compare the performance of Flo Hyman of the US Olympic Volleyball team to that of Japan's best player. The stick figures on the screen can be rotated to any angle by using a joystick to give a threedimensional quality. display as well as its centre of gravity. When the performer is present this is reasonably easy. But if he is not there, Ariel derives the material from massive compilations made by NASA. Ariel uses the NASA tables to find the ratio of body segments to total body weight; of segment lengths to total height, as well as the body's specific gravity. He feeds the anatomical data into the computer, along with the joint centre positions. Using his knowledge of the film speed and the displacement of the joint centres during the whole motion sequence, the analyst can calculate the velocities of body segments. From the velocities of the segments he can work out the acceleration at play and the computer can give him a segmental breakdown of information detailing the whole motion - including speeds; accelerations; horizontal, vertical and resultant forces; the amount of the muscle action in each joint and differences resulting from the discrepancies in body builds. The computer analysis of Wilkins' performance revealed that he was actually about30 per cent faster in his swing than fellow throwers who were also filmed. But he was dissipating the speed at the end of his turn. The computer projected that with a perfectly timed summation of forces, Wilkin, would be able to throw the discus 76 m. And putting his knowledge of his potential into practice, Wilkins went on to win the Olympic Gold medal in the event with throw of 70.9 m.
An analysis of shot putter Terry Albrittor revealed a similar problem. Albritton wa1 bending his front leg at the knee just as he was about to release the shot. 'It was like trying to throw from a trampoline or shoot a cannon from a canoe' said Ariel. One month after this analysis, Albritton became the next world-record holder - putting the shot 21.85 m.
Above a threedimensional analysis of football place kicking. The stick figures show four different views of the same action. From such data it is possible to work out all the forces and angles at work, and to improve the player's technique. One advantage of running with long strides is the reduction in the number of strides. But biomechanical analysis indicated that each running stride is associated with a braking force which stops the forward motion of the athlete. The larger the stride the greater the braking force. Ariel calculated that the optimum stride length occurred when the braking force was at a minimum. He reckons that the calculation of the precise relationship between stride and braking force could increase the individual's running efficiency by as much as 20 per cent. Leaning forward at the hip also contributes marginally to running efficiency, as does landing on the ball of the foot rather than the heel. But although guidelines and techniques can be posited, there is no perfect formula for any given activity. Every individual has his own specific centre of gravity and type of body-build, and perfection lies in the individual's ability to make use of the findings of his own personal analysis. American footballers have improved their kicking technique by filming dead-ball kicks (left) from different angles. This provides positional data that can be processed by a digitizer which inputs the relevant information for computer analysis. Right A highly sensitive force mat is able to transmit readings of four kinds of pressure, sideways, forward vertical or twisting to an oscilloscope. Dr Ariel has charted the forces of footstrike at every point of contact In different shoes to check their ability to absorb shock. Results show that heel design Is not as important as was once thought by shoe manufacturers. Above and above left Computer control of this hydraulically operated exercise machine offers the athlete Immediate feedback on his performance via a monitor. Programs can be designed to suit any sport, giving optimum results fast. the player's physiology; his strengths and weaknesses; his body peculiarities and fitness goals. The computer uses this profile to adjust the pressure, speed and duration of the 4000's drills. And the precision of biomechanics can be used in the prevention of injury as well as in rehabilitation. By showing the individual how to move properly without putting any unnecessary strain on any part of the body, Aeriel's analysis can improv posture and prevent pain - increasing th athlete's chances of real success at th same time. Ariel has applied the biomechanicz analysis techniques to films of athletes ii action. In one study, he compared Jesso Owens' performance in the 1936 Municf Olympics to that of the 1977 world recorc holder for the 100 metres - Eddie Han Owens ran on a cinder track, without start ing blocks, in 10.2 seconds. Hart's record - on a polyurethane track, with blocks -wa 9.9 seconds. Ariel calculated how many de grees per second their ankle, hip and kne( joints displaced. He knew the length of th( bones and the speed of the film frames - s( he also knew how much distance was co vered per second. He let each man cove 100 metres, and computed the time it tool him. Jesse Owens won. Digitizing from film is an expensive anc time-consuming process - the film needs tc be developed before the computer analysi! can properly begin. So Ariel is working or what he calls 'real-time digitizing' where the feedback to the subject would be im mediate. At present, video does not have the resolution to be a viable alternative tc film but infra-red sensing equipment mad be the answer. Ariel has developed a device called Selspot which uses infra-red light emitting diodes to transmit the position o~ the objects to which they are fixed. Foi example, he can fix hundreds of diodes tc the shaft of a golf club with each diode attached to a source of electricity. The diode! put out thousands of signals a seconc which are picked up by two cameras anc fed to a processing unit. Any golfer swinging his club can get an immediate analysi! of his action. But this does not mean we are all destined to be champions. Knowing our mistakes is one thing - being able to correct them is another. At the Coto Research Centre, another instant analysis machine can determine z multiplicity of movements when a subject moves on a force plate known as the Kistlei Force Platform. 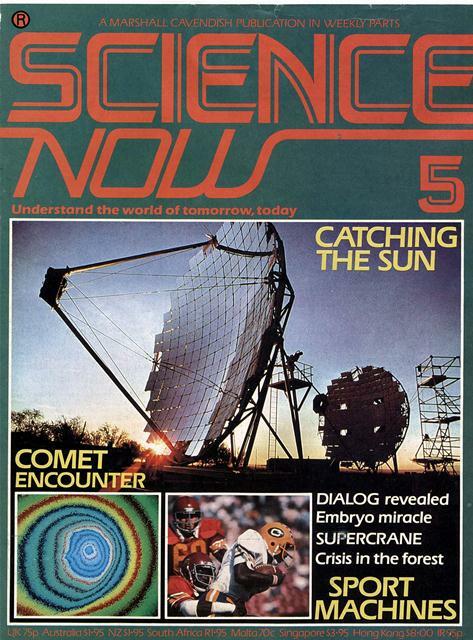 The person's movement or the plate is transmitted by means of sensitive detectors to the Selspot II systerr which, with the help of a computer, provides immediate feedback - as either a twoor three-dimensional image of the action. Below A graphic illustration of the pressure variation over the sole of the foot. The main area of pressure is on the ball of the foot where the highest peak occurs. Here the greatest shock absorption properties are needed to aid running. Generated on 4/24/2019 9:16:49 AM (PST) ADI/HQ/GBA/2019/ARIELCLOUD/v3.0.2018.0126.